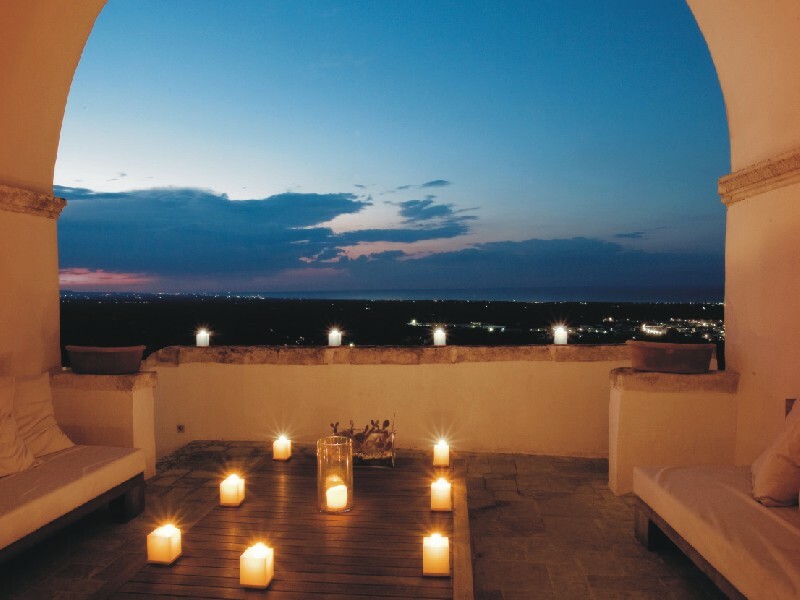 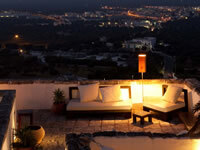 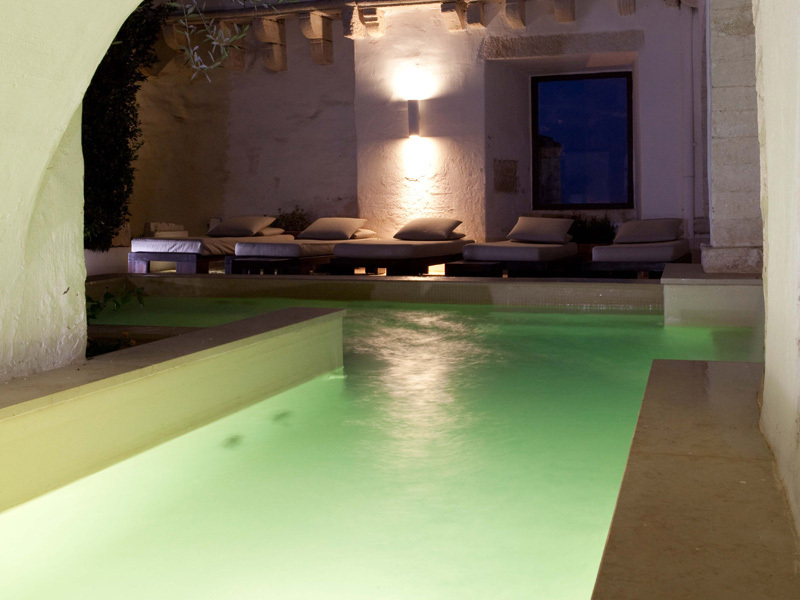 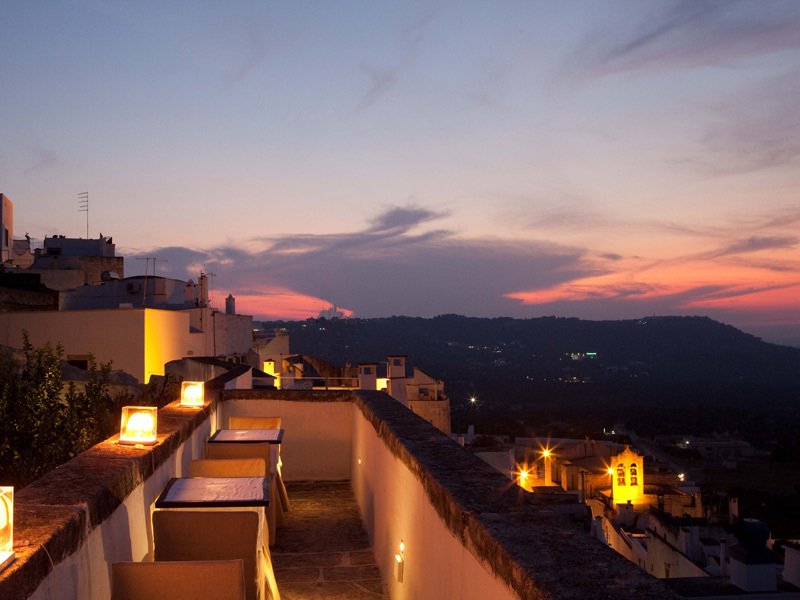 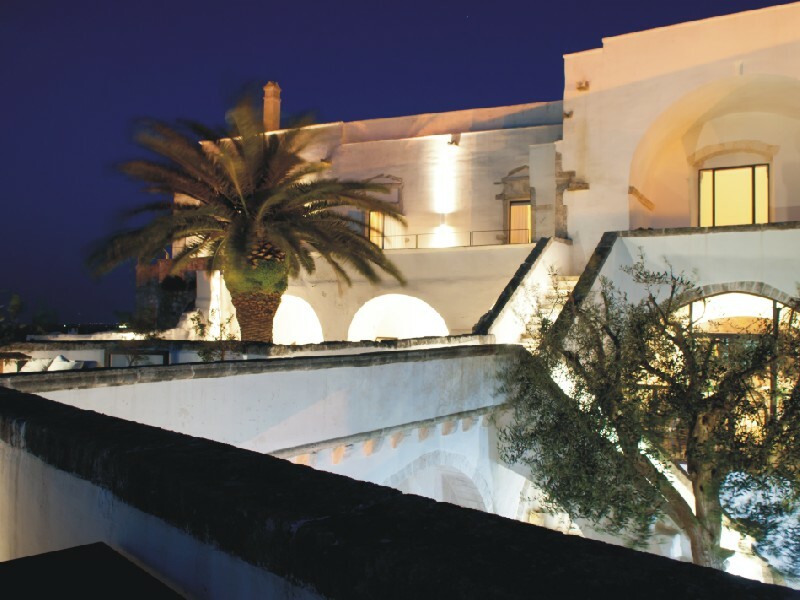 La Sommità Relais is a charming 5-star boutique hotel located in a 16th century mansion in Ostuni city centre. 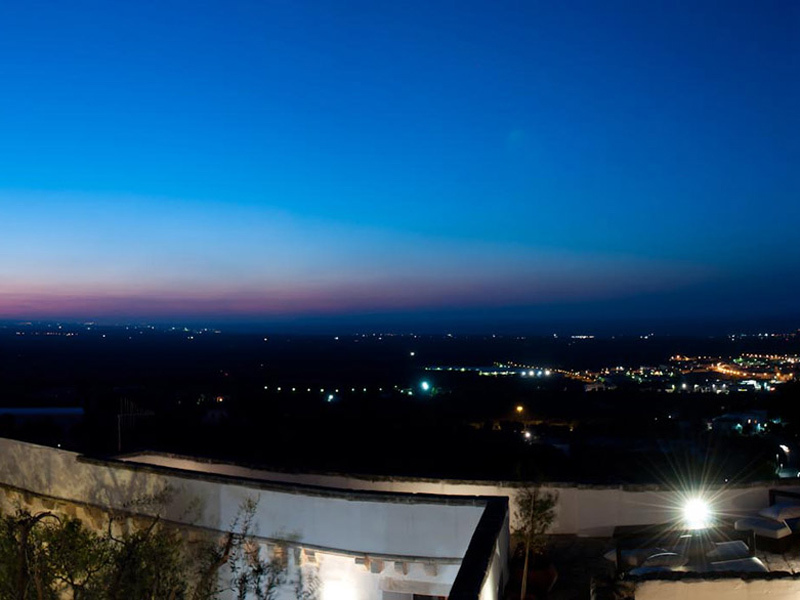 Its name derives from the hotel position, which is on the highest point of the White City; this is also why you will enjoy a breathtaking view over the valley of olive groves and the coast. 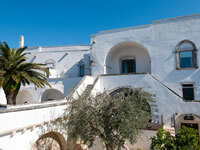 Parking is a bit far from the hotel, but guests are escorted to the entrance with a nice Ape Car or Mini Cooper. 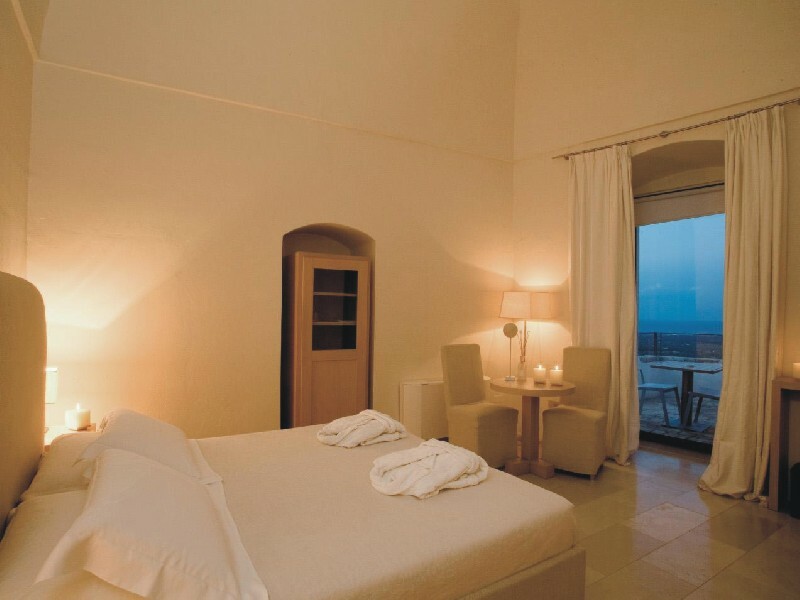 The hotel consists of several buildings featuring suites, restaurant, spa, meeting room and terraces; the interior has shades of cream and white that help your peace and relaxation. 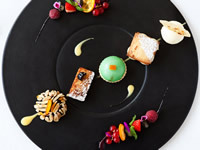 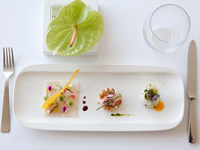 Relais La Sommità boasts a 1 Michelin star Restaurant run by the chef Sebastian Lombardi; he creates traditional recipes with an innovative touch. 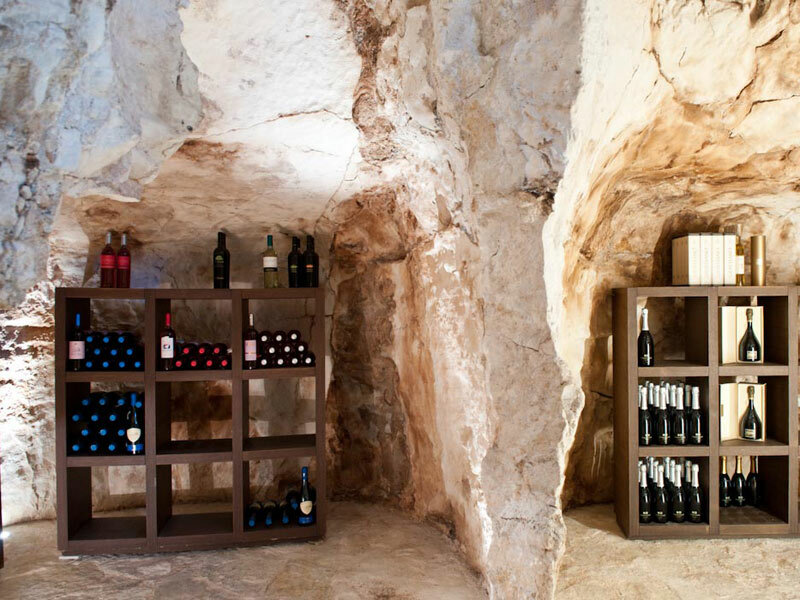 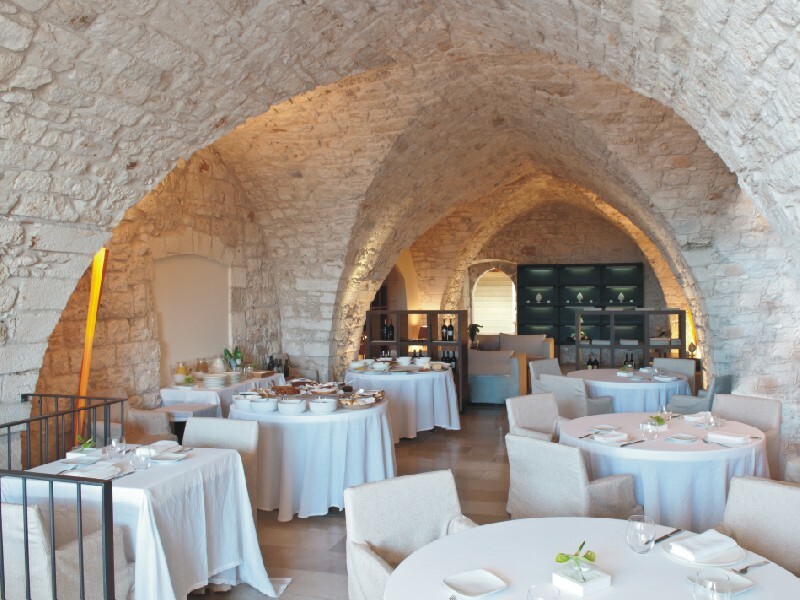 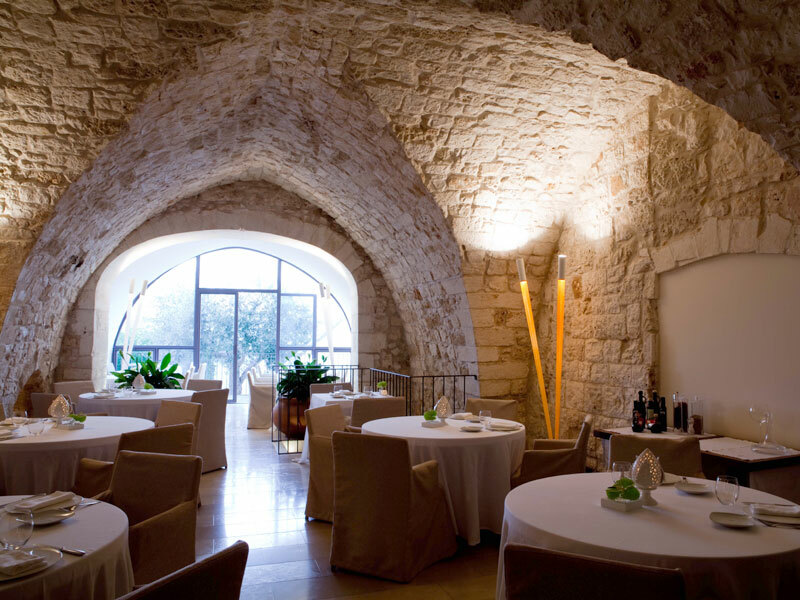 Each dish is accompanied by wines from Puglia and Italy, kept in the underground cellars; a stone staircase leads to the wine cellar, a room with three ancient tanks, once used to store oil and now location for wine tastings. 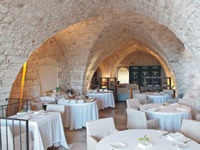 In summer you can dine outside, surrounded by the orange and olive trees in the garden; moreover, the restaurant organises cookery classes, wine and olive oil tastings, business lunches and events. 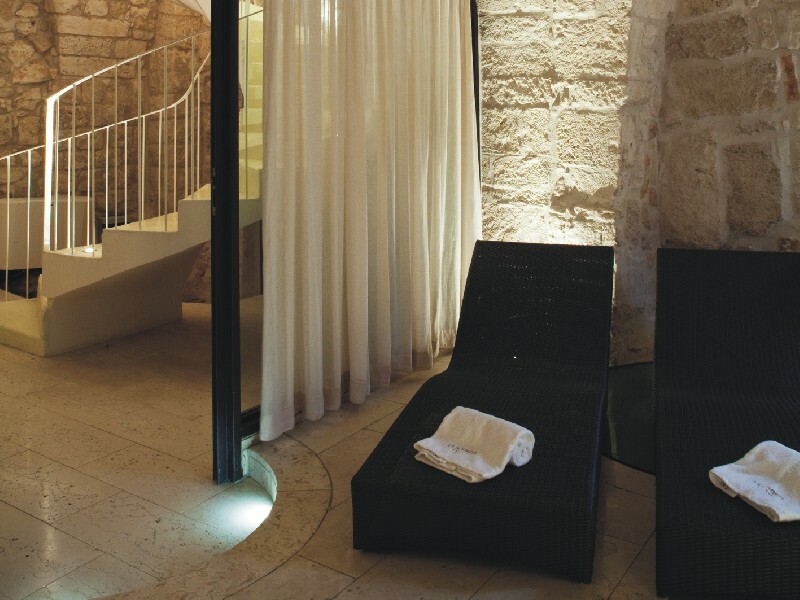 The Spa at Relais La Sommità offers massage, turkish bath, hammam, outdoor jacuzzi and personalized treatments. 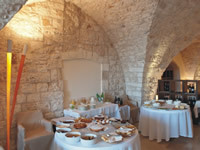 The Relais has various rooms for meetings and events that can accommodate from 20 to 90 people and are provided with audiovisual equipment: 1 meeting room indoor and 3 outdoor spaces. 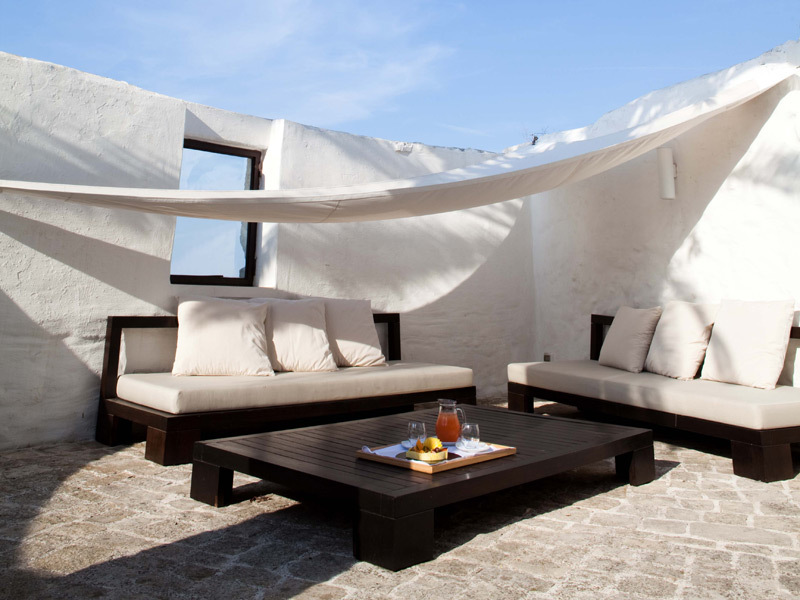 Finally, guests can enjoy a drink on the terrace or relax with a book in one of the grand parlours of the mansion. 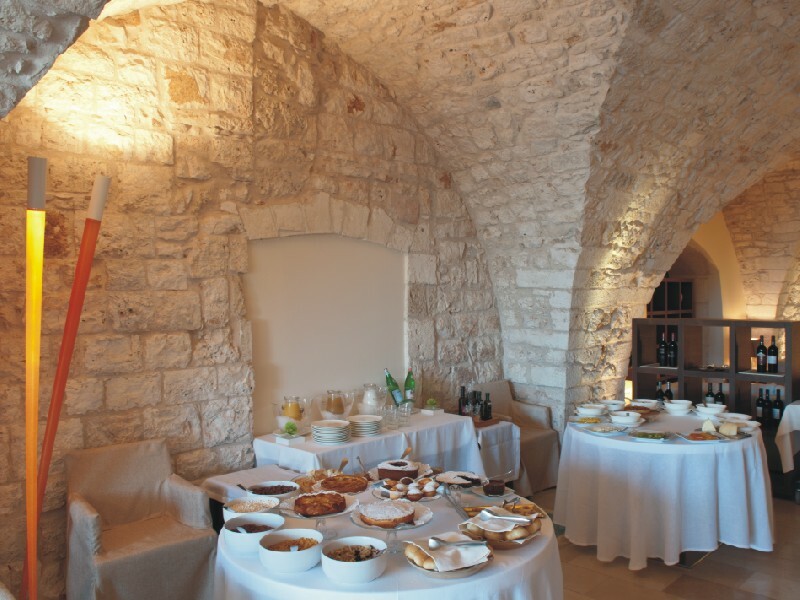 Your stay at Relais La Sommità will certainly be an unforgettable experience and an opportunity for the 5 senses to discover the colours, scents and flavours of Puglia. 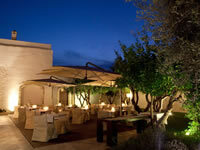 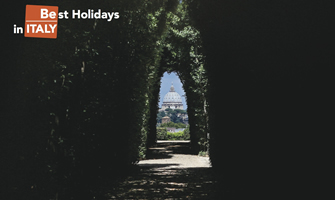 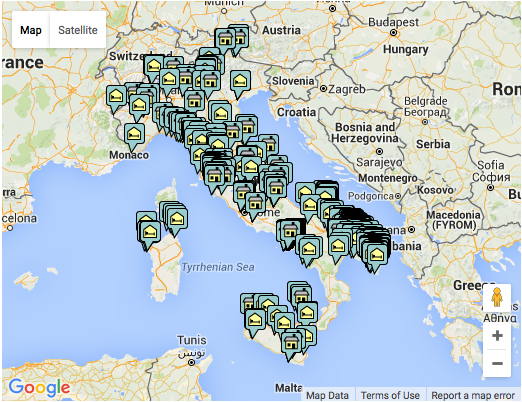 Relais La Sommità has 15 spacious rooms with their own name and character. 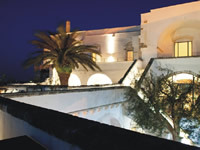 The rooms, all ensuite, are divided into 1 Master Suite, 5 Suites, 5 Deluxe View and 4 Deluxe; each room has exposed stone and elegant fabrics and it´s equipped with air conditioning, safe, minibar, satellite TV, WiFi and LAN Internet, hair dryer, bathrobe, slippers and Bulgari or Culti amenities. 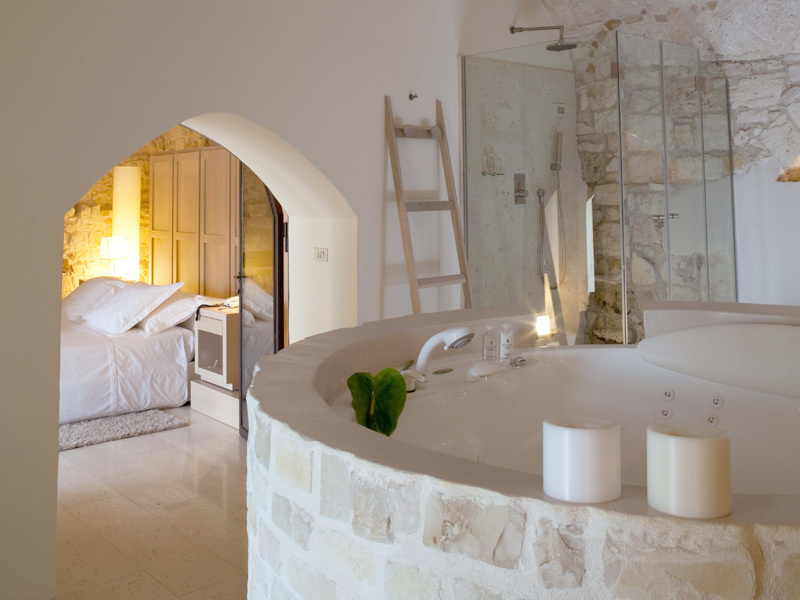 Le Volte Master Suite: characterized by vaulted doors, the room has exposed stone walls, king-size bed, bathroom with Jacuzzi for two, large panoramic terrace. 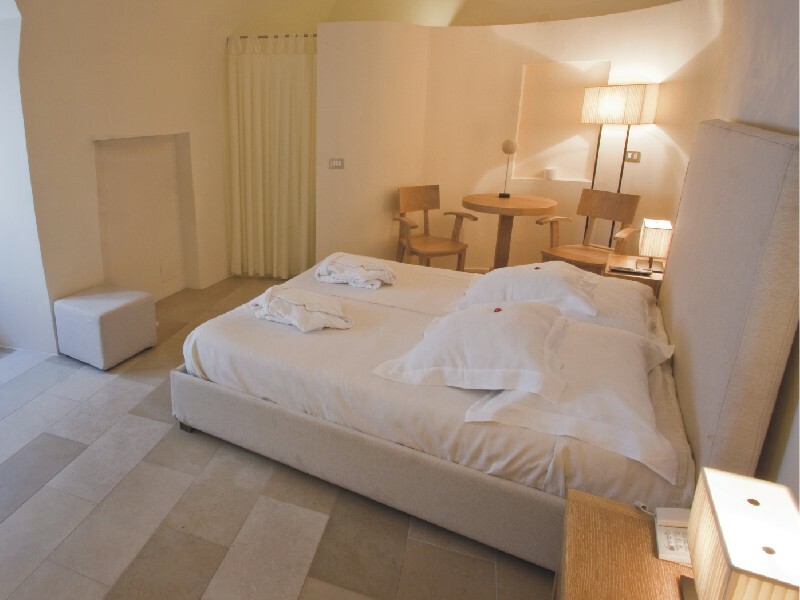 Il Camino Suite: characterized by a fireplace in the living room, the 52 sqm suite is very bright and has king size bed and bathroom with stone shower and bath. 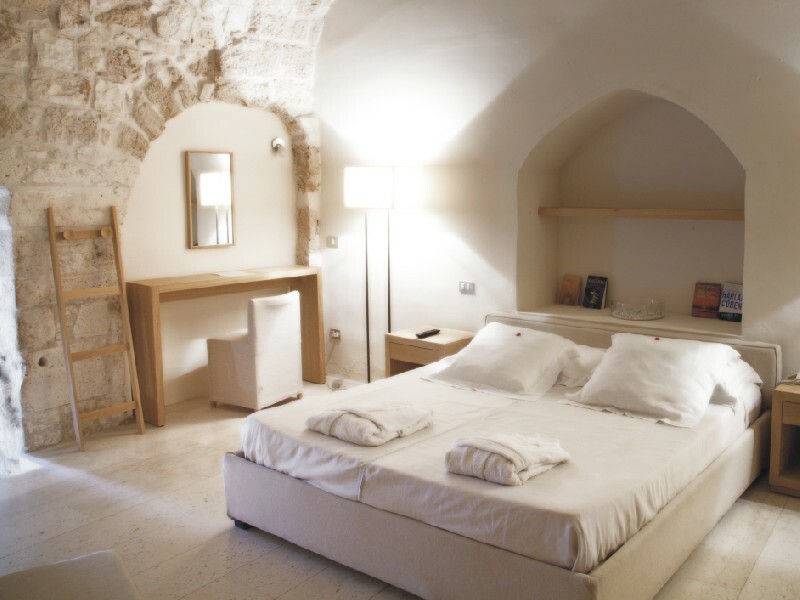 La Cattedrale Suite: the 49 sqm room has two levels with the living room on the ground floor and bedroom with king size bed and bathroom with bath and stone shower on the second level. Bright suite thanks to a skylight in the ceiling. 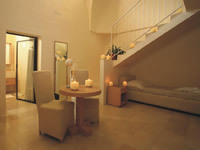 L´Aurora Suite: up to 4 people. 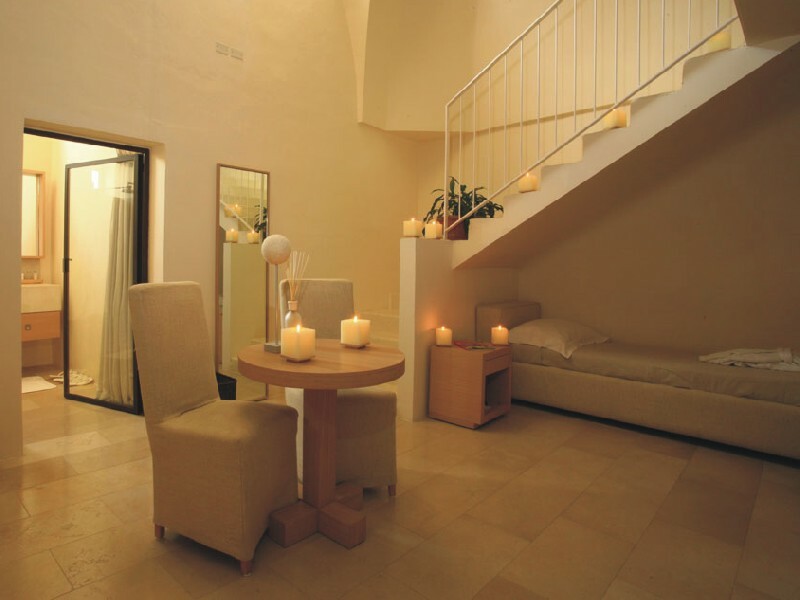 The 70 sqm room is on two levels: the first with bathroom with stone shower, balcony and living area (sitting room and sofa bed), the second level with king size bed and open space bath. Il Cielo Suite: up to 4 people. 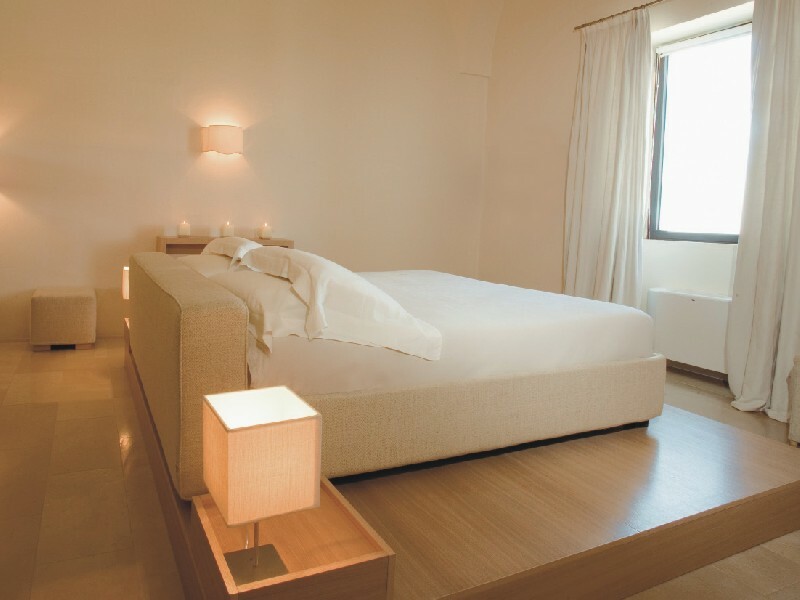 The 49 sqm room is on two levels: the first has living room with two sofa beds and bathroom with stone shower while the second level has two queen size beds and a Twiggy chandelier (Marc Sadler Design) by Foscarini. 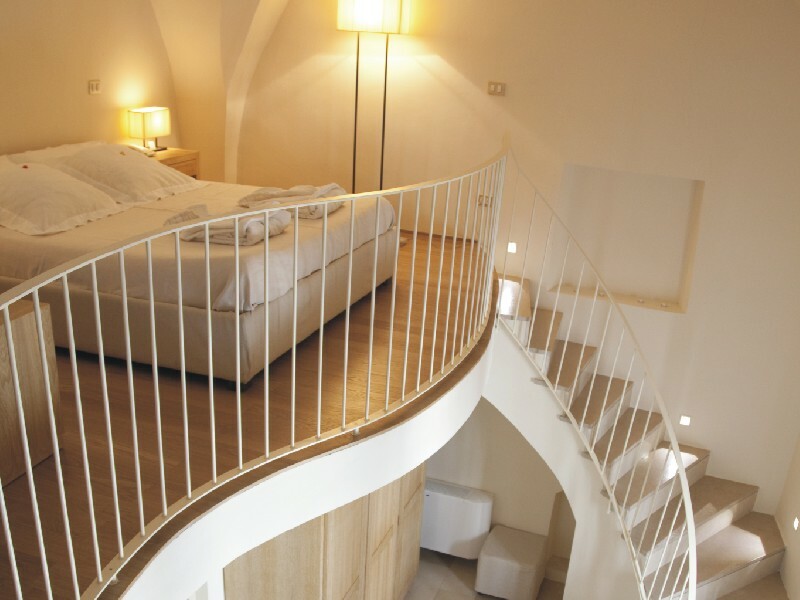 Suite with a skylight. 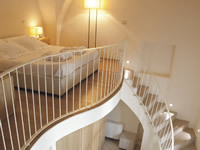 Il Colle Suite: the 37 sqm room is on two levels. 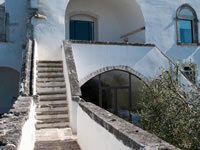 The first has a sitting area and a bathroom with stone shower and the second level has a king-size bed. Il Mare Deluxe View: the 37 sqm room has a bathroom with shower and a king-size bed located on a central platform before the window that overlooks Ostuni sea. 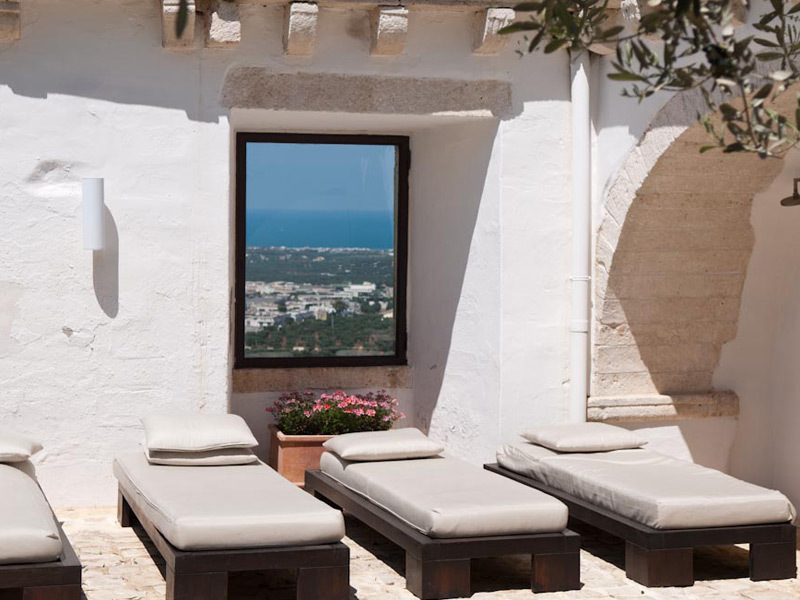 L´Aranceto Deluxe View: the 35 sqm room offers views on the orange garden, a king-size bed on a central platform before the window and a bathroom with shower. 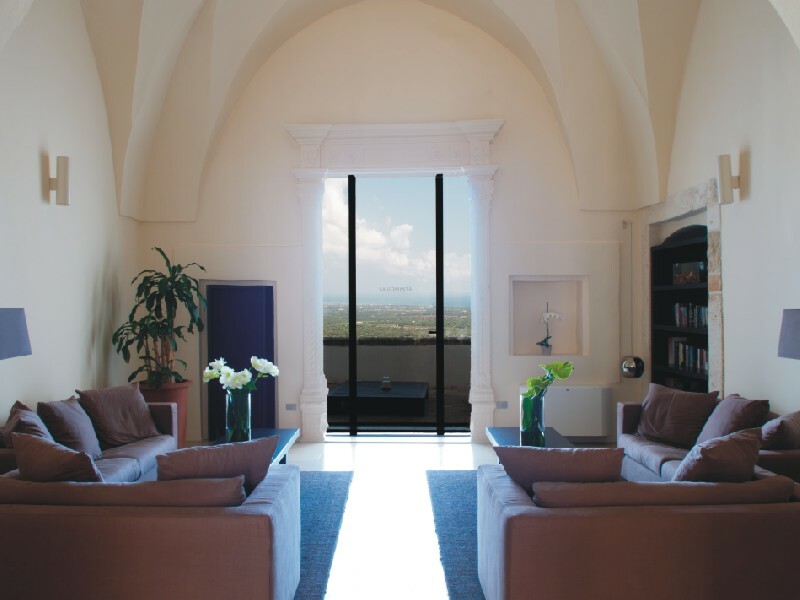 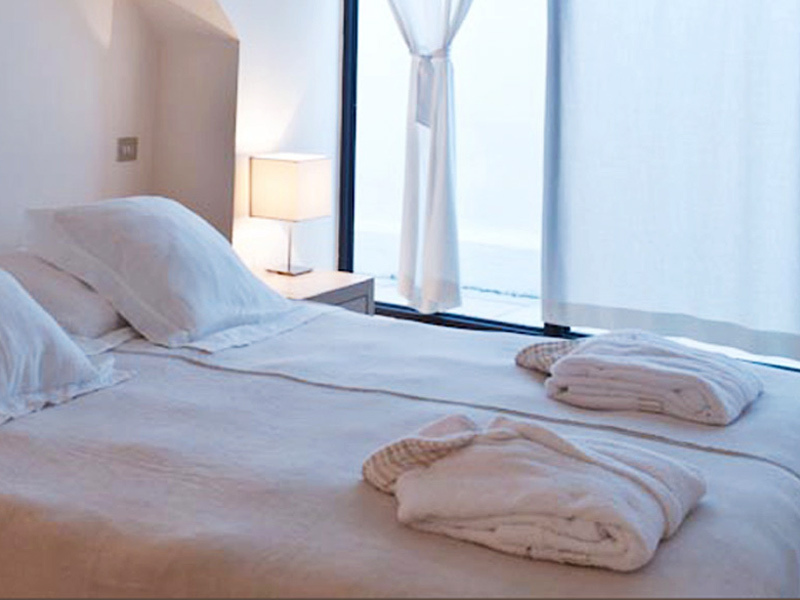 La Torre e La Palma Deluxe View: the 25 sqm room has double bed, wardrobe, bathroom with stone shower and panoramic terrace. 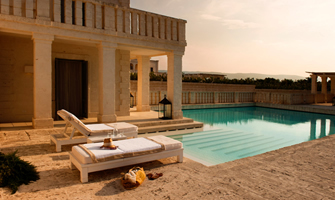 Il Sole Deluxe View: the 30 sqm room has double bed, wardrobe, bathroom with stone shower and panoramic terrace. 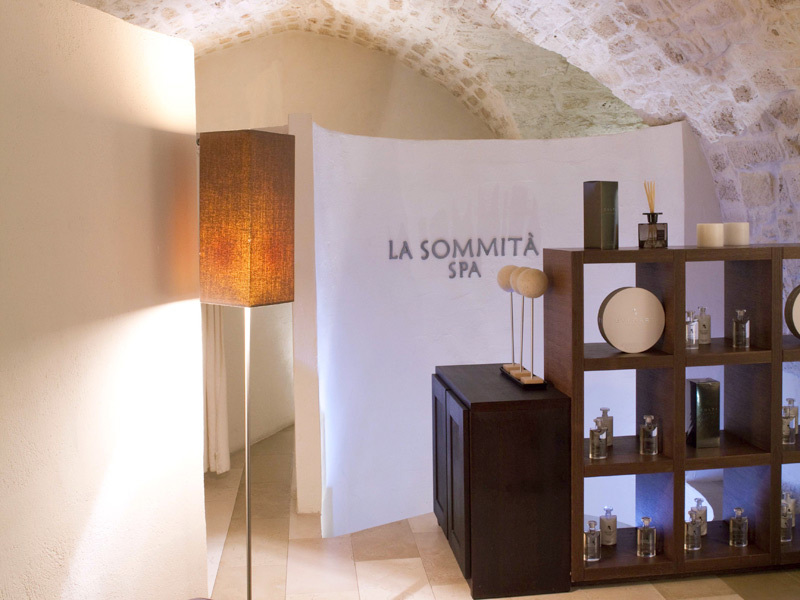 L´Affresco Deluxe: characterized by a fresco that was found during the renovation. 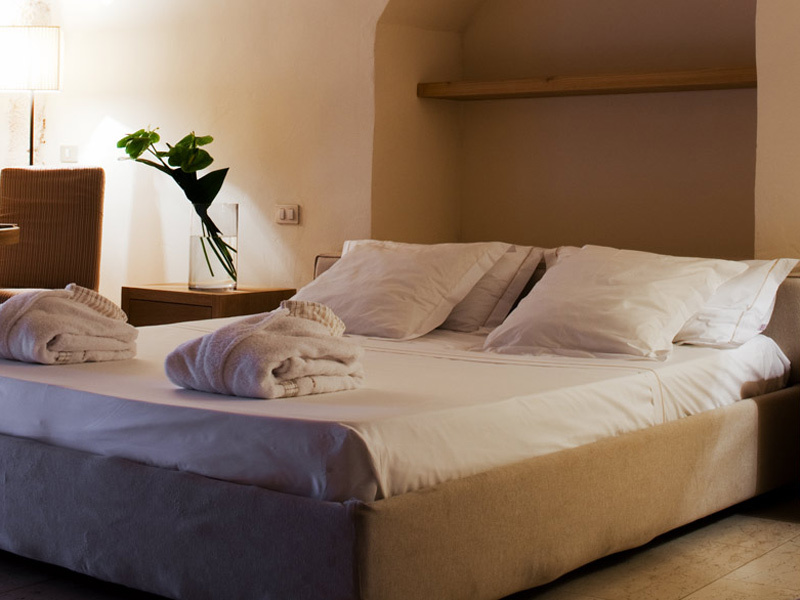 The 24 sqm room has king size bed, window overlooking the old town and bathroom with stone shower. La Loggia Deluxe: the 30 sqm room has a star ceiling, a king-size bed and bathroom with stone shower. 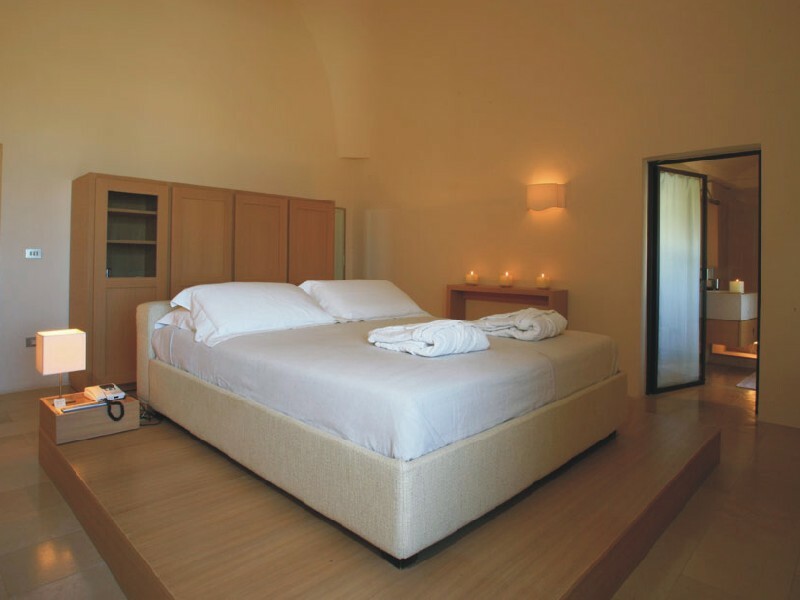 La Corte Deluxe: the 25 sqm room has a king-size bed, a business corner with table and chairs, bathroom with stone shower and skylight in the ceiling. 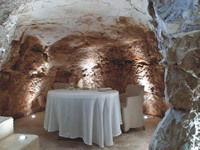 La Grotta Deluxe: the 28 sqm room is entirely made ​​of stone with panoramic terrace and bathroom with stone shower. 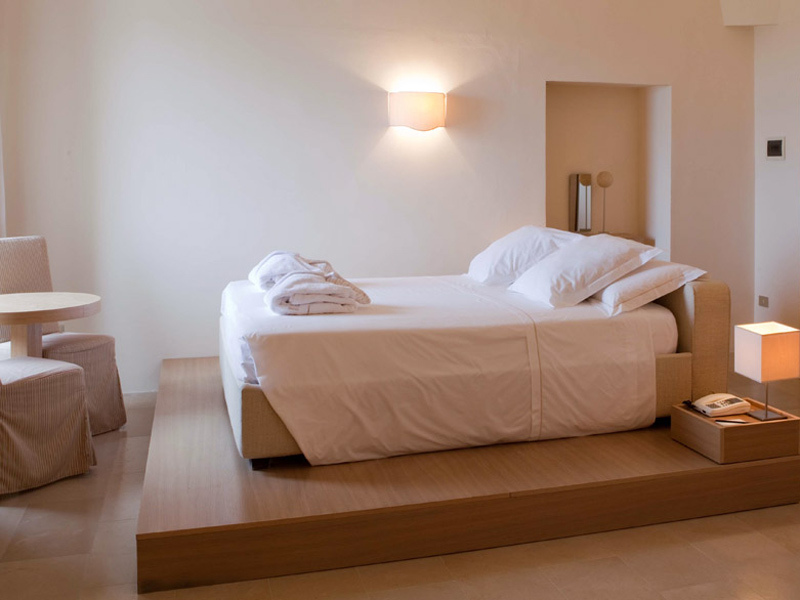 Extra bed only available for Deluxe View room categories and suites. 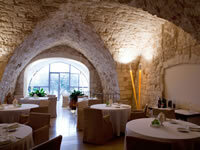 Pets: € 20 per day (max. 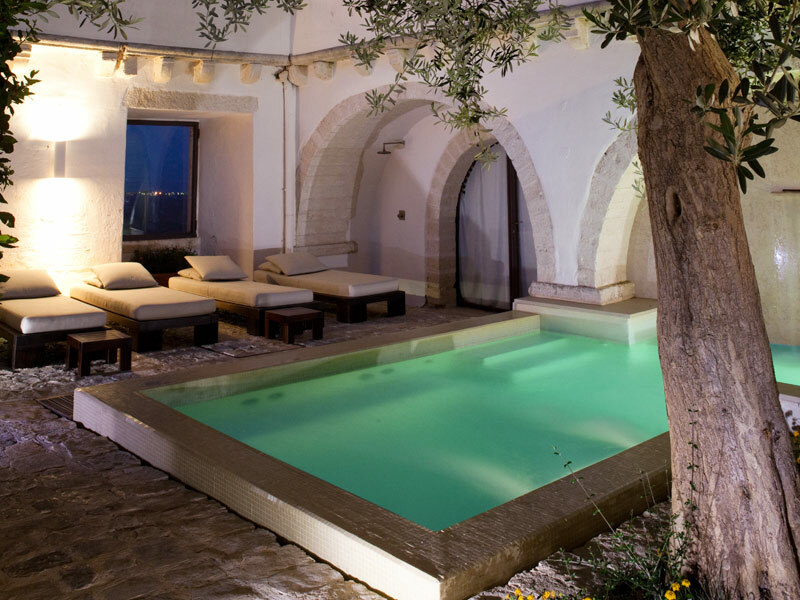 one per room). 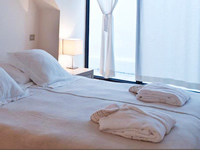 over 12 years € 90 per night in extra bed. Cancellations received after the defined limits or "No Show" will be charged the full stay.